How to Troubleshoot and Fix Malfunctioning WordPress Theme? Want to know how to troubleshoot a malfunctioning WordPress theme? In this post, we will explain how would you troubleshoot a malfunctioning WordPress theme. WordPress is a widely used platform all over the world. This platform is built with a bundle of features where you can create a wonderful blog or website within a couple of minutes. WordPress is very easy to understand and useful tool. Even beginners can create an effective blog or website. Installation of a WordPress always begins with a theme. A theme is an effective tool that gives a visual treat for your website. Aesthetic themes will make your website stand out from the crowd, which will increase your conversion. With a wonderful appearance, it will attract users and increase traffic. You can customize the themes with colors, fonts, borders for your web pages. Free WordPress themes are available in the official repository or you can get premium themes through the third party. But at times when you install or change a theme, WordPress starts showing error or the theme might not be working effectively. In this post, we will show the basic troubleshooting methods of malfunctioning WordPress theme. Update of any software keeps your mobile and computer healthy without any issues. In case if you don’t update any software you might face vulnerabilities and won’t be able to access the new features, where you will behind the technology. Skipping an update may also lead to cyber attacks. The same scenario applies to WordPress themes. A theme which you are currently using may have a security bug, so it is easy for the hackers to break your data. Knowing the issues, the theme developer has overcome the issue and updated the theme. In case if you don’t update the theme, you will be facing the same issue. Developers will be often updating the theme to improve the performance and lock down the security issues. Whenever a developer updates the new, you will see a notification on your admin panel. Once you see that, you can update your theme, certain themes come with automatic updates and installation. Always install the latest version of the theme whenever you wish to change a theme. Whenever you install a new theme to your WordPress website, they include configuration changes to how your subpages are managed. So that it might change the URL format and cause errors to your visitors. In order to avoid this situation navigate to the WordPress dashboard > Settings menu. Then move to the permalinks submenu. Once entered in the menu, click on the “Save Changes” button at the bottom of the page to clear the permalinks. Once done it will update all your pages URLs to be linked together effectively. Whenever you shift to a new WordPress theme or customize your existing theme, you will find a time gap that the changes to be reflected on your browser. The reason is that of caching. Browsers will automatically store certain data locally in order to load faster in the future. When comes to WordPress themes, browsers will cache the stylesheet information such as colors, fonts, layouts etc since these elements don’t change often. In case if you edit your WordPress themes to a larger extent it is just to clear the browser cache. You can easily clear the cache using WordPress cache plugins. Keep in mind that it is good to clear the cache rather than disabling it. Because disabling the cache may reduce your websites speed and performance. If you are planning to switch to a new WordPress theme, it requires certain configuration settings, so that the theme works effectively. Always prefer a theme from the standard market such as the official WordPress repository, elegant themes, ThemeForest etc. Don’t simply search for the theme and never go for illegal themes. Certain resources may provide a premium theme for free but never trust those resources. However before moving to a new theme, always make sure that you have a backup of your website. Also check for the reviews and ratings for the theme which you prefer, because certain themes may not be updated for the past few months. In case you cannot get ample support from the theme or there won’t be added functionalities in the theme. You can even install the theme directly from your WordPress dashboard and activate it. Another troubleshooting method to solve the WordPress theme is by looking at the plugins can resolve the problem. Plugins are actually small scripts or tools that are developed by the developers can be added to the WordPress website to add additional features to your website with a single click. Though they are used to add features they might bring some complication to the theme. You have some plugins that are running on your website. But you might not know which plugin is causing the issue. In that case, disable all the plugins and install one at a time to check which plugin causes an error. If you find the issue plugin, make sure to check the latest version of the plugin. If your plugin is not with the latest version even that might cause an error due to its incompatibility. Though you update and facing the issue, contact the developer and check for it. In case if the team is not able to support you, then you have to disable the plugin and replace with another plugin. To avoid complexity and errors, make sure you don’t install multiple plugins for the same functionality. Choose a single plugin for a particular feature, because often duplicate functionalities many cause error. These are plenty of ways to troubleshoot a Malfunctioning WordPress theme. The above listed are the most common reasons to troubleshoot a Malfunctioning WordPress theme. Themes are essential for any WordPress website that gives you a wonderful look and feel experience. Installing a theme is one of the basic steps to create a WordPress website. But you may face issues while working with themes or when you install a new theme. 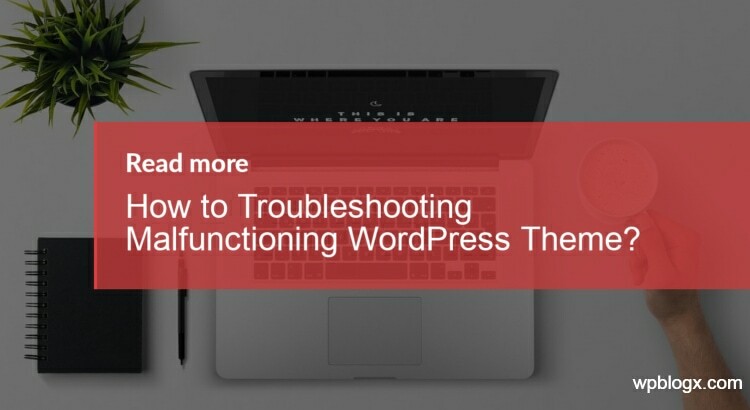 Hope you got an idea about how to troubleshoot a Malfunctioning WordPress theme. If you have any queries or if you feel any other common methods to troubleshoot please feel free to share with us. So that it will be helpful for the upcoming readers. You can subscribe to us on Facebook and Twitter.